A lot of pots! Surely, you may think, this post is not going to describe all of them? Too much pottery! Not to worry, I am not going to try that – there are 34 clay vessels shown in our picture, and each one of them could be the focus of an “another thing” post by itself. Today, however, I have chosen the image as a metaphor. This post is being written in the final hours of the final day of 2015 – a new year is upon us, and traditionally it is the time to look back at what has come and gone and to look forward at what the new year may bring, for Peter Sommer Travels, for the art and archaeology of the countries we love to visit and we love to show you, and for our guests and readers. The great staircase in the western façade of the Palace of Phaistos, ca. 1700 BC. 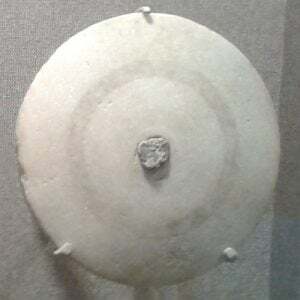 The picture shows a display in the Archaeological Museum of Iraklio (Heraklion) on Crete. It consists of a large tripod cooking or serving tray, on which 33 miniature vessels of various shapes have been arranged. All of them are from the great Minoan Palace of Phaistos and all of them date – give or take – to the 18th century BC, part of what is known as the island’s Protopalatial period, when the first (so-called) palaces stood and flourished at Knossos, Phaistos, Malia and elsewhere. 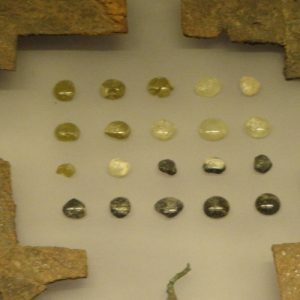 Thus, they offer a tiny window into the vast and fascinating world of the Bronze Age Aegean. On this blog, I have not yet had time to write about the Bronze Age as much as I would like to, and especially about the Minoan Palaces (only the frescoes of Knossos have made an appearance so far). 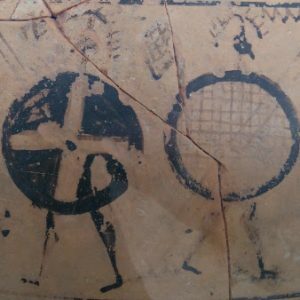 Likewise, we have probably not given quite as much attention to pottery (of any period) as we might, considering that this essential technology provides the “type fossil” for nearly every period of archaeological interest in the Mediterranean, from the Neolithic right until the Middle Ages. But we’ve made a start: past posts treat pottery as art, engage with the trials of pottery production, deal with potsherds as a political tool, home in on Roman clay lamps and look at the story told by a Bronze Age clay pot from Santorini, and surely there will be more. 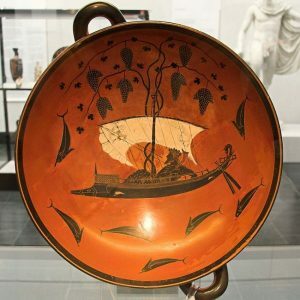 As near-omnipresent objects of use in every-day life, of ostentatious representation and of artistic expression, also indicating dietary habits, cooking methods, transport networks, technological exchange and so on, pots and pottery accompanied our ancient forebears from birth to death – and beyond. We’ll come back to all that. Incidentally, Phaistos is rightly famous for the remarkable quality of its decorated pottery, such as this “Kamares Ware” “fruit stand”, also from the 1700s BC. For now, let’s stick with the exhibit’s label. It states that these vessels, found throughout the large and mysterious building that is the palace of Phaistos, may have held perfumes or small quantities of seasonings, and that some may have served as toys. I’ll add more options here: some could have been used in food preparation or serving and some might have been drinking cups or pouring vessels. And that’s why they are a great metaphor: these fairly humble pots all embody the potential for narrative, for story-telling developing from the object itself, be it a huge temple or a small pot: that’s what we hope to do. On all our trips, we show you many things, some famous, striking and well-studied, others more obscure, less spectacular but no less fascinating. For all of them, there are great stories to tell, to share or to imagine. We trust that 2015 has left you with some fine stories and good memories, and we hope that 2016 will bring many more of them – perhaps even on one of our escorted tours in Europe? For example, you can see this very display, along with Phaistos itself, on our Crete tour. We wish a Happy New Year to all our readers and guests.